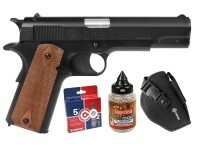 If you like 1911 firearms but can't afford or find the ammo, this is the CO2 BB pistol for you. The blowback adds another dimension of realism if you plan to use this CO2 gun to maintain firearm proficiency. Even better, ammo is cheap and available. A great plinker, this 1911 gives you a historic feel for an air pistol price! With Pyramyd Air Crosman GI Model 1911 kit you'll be range ready with 20 shots per clip, 1,500 Crosman copperhead BBs, 5 CO2 12-gram cartridges, and a nylon belt holster. Things I liked: Feels like a real M1911. Has a good weight to it too. Things I would have changed: Add a working thumb safety instead of the push in button safety. Slightly better magazine, sometimes the magazine doesn't side into the gun as smoothly. Also the included belt holster can barely fit the gun itself. What others should know: It goes through CO2 quick. Got around three magazines (20 bbs per mag) before the C02 started to go out. It's also quite loud during the first magazine. Update: The magazine broke after shooting 140 bbs. Things I liked: Like the feel and looks of the gun. Things I would have changed: Sadly the clip would not hold the BB's after the third or four time! Goes through the CO 2 Quickly...Too much loss because of the big blow back. What others should know: There are sending me a new clip. I'll find out soon if the clip was a fluke? Is that weight of 4.5 lbs correct?